My team and I seem to be using more and more words, yet communicating less and less. Today more than ever, we live in a visual society. Especially in the online world, everyone relies on the power of photos and engagement of video. Research from IBM found that 90% of all data collected in history has been generated in the last two years. Research from Cisco found that 90% of all data transmitted online today is visual. Roam’s experience indicates that 90% of leaders have no idea how to effectively use visuals in their business. 90%-90%-90%. We’re generating more data than ever, that data is overwhelmingly visual, and most of us don’t know how to use images. No matter what business you’re in, the future of your business is visual. As a church leader, it is incumbent that you get better at using visual images in your communication. Whether drawing them, looking at them, or talking about them, visual communication adds enormously to your listener’s ability to think, to remember, and to do. Visual imagery is, in itself, another whole language. Being fluent in that language gives us mind-boggling power to articulate thoughts, communicate those thoughts, and solve problems in ways we otherwise wouldn’t be able to. Visual Leaders explores how leaders can support visioning and strategy formation, planning and management, and organizational change through the application of visual meeting and visual team methodologies organization wide—literally “trans-forming” communications and people’s sense of what is possible. 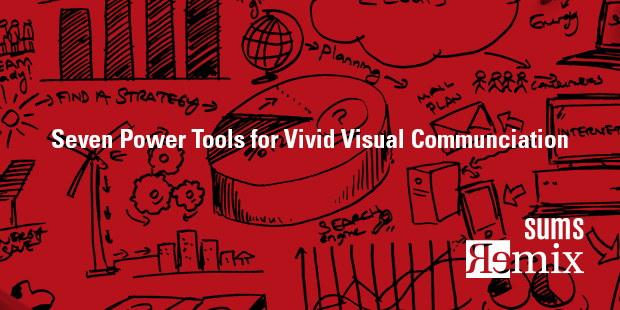 It describes seven essential tools for visual leaders—mental models, visual meetings, graphic templates, decision theaters, roadmaps, Storymaps, and virtual visuals—and examples of methods for implementation throughout an organization. Visual Leaders answers the question of how design thinking and visual literacy can help to orient leaders to the complexity of contemporary organizations in the private, non-profit, and public sectors. The power of an iterative, creative process that maximizes the use of visuals cannot be overstated. People learn, grow, and contribute when they “get” the dynamics of complex issues from a variety of perspectives, and they get it best when they can visually see it. As a result, to most effectively lead, regardless of our organization’s life stage or current issues, we must consistently build skills to facilitate using different visual tools and formats. To master a new way of thinking you will need to do a lot of visual note taking and playing around with ideas. But it is possible to “reprogram” your brain. Writing, drawing, diagramming, and visualizing are direct ways to do that. There are seven tools which can help lead to new levels of awareness and upgraded mental models, and then to more effective responses to situations. Metaphors and Models – Connecting your vision with compelling imagery and mental models that leaders can use to keep their organizations focused on the big picture while working on the details. Visual Meetings – Engage people and create an environment where your people feel comfortable working visually. Graphic Templates – Providing light, intellectual scaffolding for critical planning meetings, reports, and other visual communications gives visual leaders a chance to guide the attention of the organization in productive ways without having to draw themselves. Decision Rooms –When decisions need aligned commitment it helps to have everyone understand the big picture as well as the choices being made. Staging panoramic meetings is a direct path, online as well. Roadmaps and Visual Plans – Visual time lines are as useful in organizational work as itineraries are on vacations. People need to know the big milestones and channels of activity. Graphic Storymaps – Leaders who show up and communicate authentically are the drivers of effective, aligned organizations. Visual maps and murals make it much easier to do this and provide ways you can stand out from the deluge of information everyone is trying to deal with in contemporary organizations. Storymaps uniquely link plans to culture. Video and Virtual Visuals – Video is as common as email for younger people and many organizations that are keeping pace with technology. This and other communication tools are allowing organizations to work effectively in distributed formats. 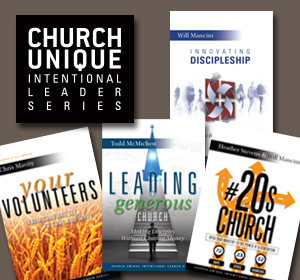 During your next leadership team meeting, identify one church-wide challenge or opportunity that has the potential to radically impact the future. Step 1: Have team members work individually and take 15 minutes to reflect on the phrases, metaphors, and stories (include Scriptures that come to mind). Consider phrases and stories from the history, creation story, or ongoing interactions of your church that might highlight the vivid future behind this challenge or opportunity. Step 2: Place individuals in teams for sharing of their top two entries for each of the Treasure Chest columns. Step 3: Ask each group to put their top three vivid descriptions on a flip chart and then present to the rest of the group. Step 4: Decide and Commit on the most powerful imagery to use in your next communication piece. Raise your team’s awareness of metaphors by: having each member listen for metaphors used in their ministries, drawing sketches of metaphors, underlining in leadership articles, and clipping strong imagery from other magazines. 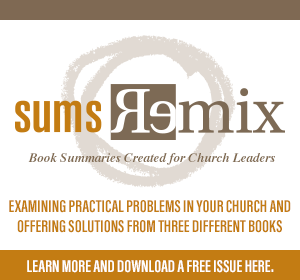 SUMS Remix takes a practical problem in the church and looks at it with three solutions; each solution is taken from a different book. As a church leader you get to scan relevant books based on practical tools and solutions to real ministry problems, not just by the cover of the book. Each post will have the edition number which shows the year and what number it is in the overall sequence. (SUMS provides 26 issues per year, delivered every other week to your inbox). Is Your Worship Bulletin a Primary Tool to Reach Guests? How Many Ministry Logos Should Your Church Have?